the regulation of social media companies. It is also “passing the buck” onto social media companies to regulate the law, whilst also refusing to clarify these categories. Join us the evening of Monday 26th March, 6:30pm-8:30pm at the Sloman lounge, Department of Computer Science, University of Birmingham. We are pleased to host Dr. Dima Saber (Birmingham School of Media, Birmingham City University) and Dr. Bharath Ganesh (Oxford Internet Institute, University of Oxford), who will be sharing their expertise in journalism and social media. Dr. Dima Saber is a Senior Research Fellow at the Birmingham Centre for Media and Cultural Research (Birmingham City University). Her research is focussed on media depictions of conflict in the Arab region, and she is responsible for leading and delivering projects in citizen journalism, particularly exploring the relation between digital media literacy and social impact in post-revolution and in conflict settings such as Egypt, Palestine and Syria. Her latest publications include work on crowd-sourced Syrian archives as memories of the Syrian war (in Archives and Records, 2017), on Hezbollah and IS videogames productions (in Media, Culture and Society, 2016), and on Al-Jazeera’s coverage of the July 2006 war (in The Journal of Arab and Muslim Media Research, 2016). She is currently writing a monograph titled ‘Archives of War: Narrating 60 Years of Conflict in the MENA’ which looks at the relation between media archives of conflict and processes of history making in contexts such as Lebanon, Egypt, Iraq and Syria. Dr. Bharath Ganesh is a researcher at the Oxford Internet Institute. His current research explores the spread and impact of data science techniques in local governments across Europe, right-wing and counter-jihad extremism in Europe and the United States, and uses big data to study new media audiences and networks. He is developing new projects to study hate speech and extremism online and regulatory responses to this problem. Broadly, Bharath’s research focuses on the relation between technology, media, and society. Previously, Bharath was a Senior Researcher at Tell MAMA, a national project dedicated to mapping and monitoring anti-Muslim hate in the United Kingdom. He has given evidence in the Houses of Parliament on governance, extremism, gender, and hate crime and authored a number of reports in this area. Thank you to everyone who joined us at BOM on Monday evening for our first-ever Halloween Social. After some initial nerves over whether anyone besides local organiser Francis would embrace the Halloween theme, our event proved fancy dress, trick or treat Haribo sweets and digital rights activism can mix. With our digital rights under threat by governments and corporations, the world can seem a pretty scary place for people who care about ensuring our rights come with us when we go online. Give yourself the night off worrying by joining us for our first-ever ORG Birmingham Halloween Social on Monday 30 October. Thank you to everyone who joined us on Monday evening at BOM for our cybersecurity for ‘real people’ workshop. It was clear from the sizeable turnout and lively discussion that plenty of real people in Birmingham do care about online security, contrary to what the Home Secretary Amber Rudd might like to believe. Special thanks also go to Mari (@bouncinglime on Twitter), who stepped in at short notice and shared with us her experience of using Tor. Our next meetup, Cybersecurity for ‘real people’, will be happening from 6.30pm on Monday 25 September at Birmingham Open Media (BOM). Thank you to everyone who took part in our meetup last month at Birmingham Open Media. This post aims to capture the main points of advice we gave about alternatives to using Google for search. We’ll be sharing more tips about alternatives to other everyday Google services in future posts. Most of us recognise the power Google, Facebook, and other internet giants have over our daily lives. Chances are, you’ve been freaked out by just how much Google knows about you (and everyone else for that matter) and what this means for our society as a whole. For a more detailed look at the issue Google poses for competition, privacy, security, and freedom of expression, please check out our recent post on why you should De-Google-ify your life. Google has become synonymous with search, so much so that don’t search for something, we “Google it”. Google is the market leader when it comes to search, but there are good reasons to be concerned about how much you’ve come to rely on the services. While most Google services are ‘free’, we pay with them through the sensitive data we divulge. Even in Incognito mode, Google’s own Your Data web page acknowledges it records and stores everything you’ve searched for and visited, and ties this back to you. Given all of this, what can you do if you don’t want Google to know everything about you? Unlike Google, which stores your search history to create a detailed picture about you, when you use DuckDuckGo the company has no way of knowing who you are and linking your searches together. DuckDuckGo’s privacy credentials haved been given a boost by the Tor project, which in 2016 made it the default search engine for the Tor browser. For more information about what Tor is and how it works, watch the video below. The downside to DuckDuckGo not ruthlessly harvesting your personal data is sometimes the search results you get aren’t quite as immediately helpful as Google and you’ll need to further refine your search in order to find what you’re looking for. Luckily, DuckDuckGo does still allow you to search Google when you need to. Bangs, named after the American term for exclamation marks(! ), allow you to directly search thousands of websites from DuckDuckGo, including Google. 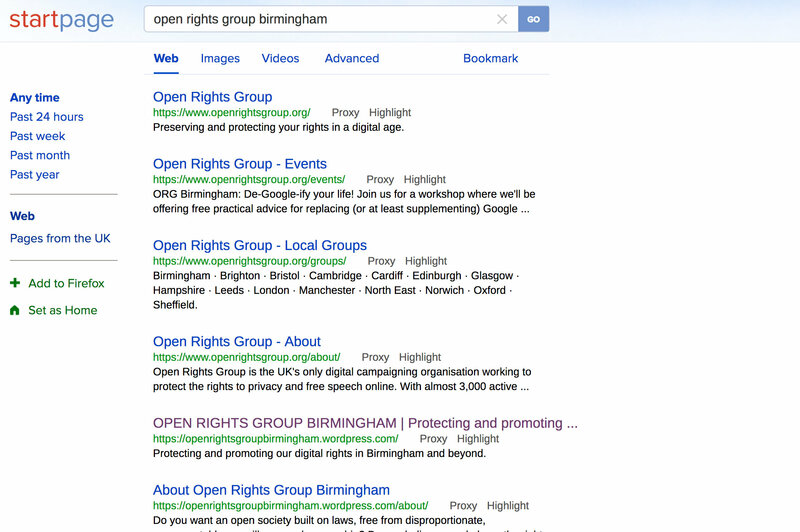 Typing in !googleuk followed by your search term will take you directly to the search results. Bangs can also be used to search Wikipedia, Reddit and thousands of other websites. While DuckDuckGo is improving all the time, what can you do if you really can’t bring yourself to give up on the convenience of Google search results? StartPage web search just might be for you. StartPage acts as an intermediary, anonymously submitting your search query to Google and returns the familiar Google results, minus the tracking. StartPage still makes its money through advertising, but the targeting is limited to the topics you are searching for and the company is not building a gigantic trove of personal information. While StartPage offers real privacy benefits over regular Google, by using the service you are still supporting the Google beast. Depending on how you feel about that, you may prefer to back upstarts like DuckDuckGo, which represent a cleaner break from the internet giant. 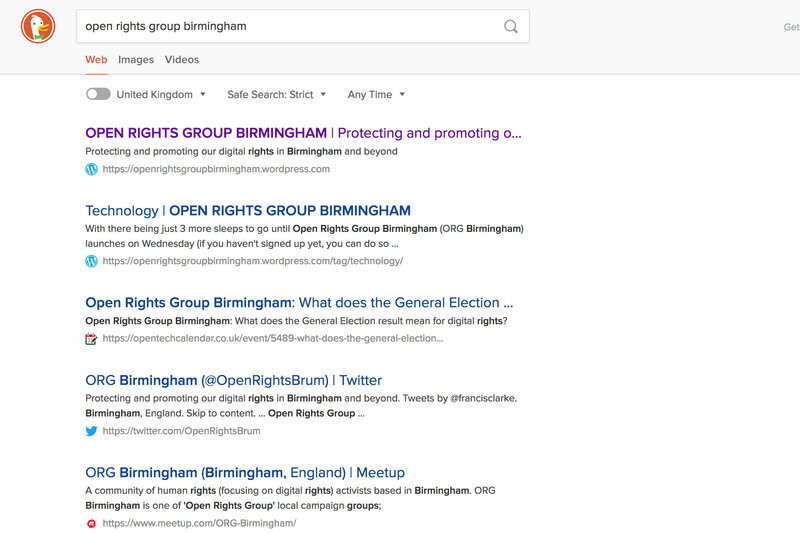 Thank you to everyone who joined us at Birmingham Open Media last week for our meetup on how to De-Google-ify your life. It was fantastic to know so many people are concerned about our collective reliance on Google services and are interested in discovering viable alternatives. Over the next week, we plan to share examples of high quality alternatives to everyday Google services. In the meantime, here’s an overview of why you should De-Google-ify in the first place. Those of you who attended last month’s meetup at BOM might remember that we had a special guest in the form of multimedia journalist, Chevening Scholar (FCO) and MA Social Media student Thomaz Pirez (@Thomaz_pirez). Thomaz had asked if he could make a short video about ORG Birmingham as part of a project he’s doing on social media.